The TRansdisciplinary Effective Assessment and Treatment (TR-eat®) model melds medical management, skill building and behavioral interventions to create a distinctive treatment method with outstanding outcomes for children with complex feeding problems. It is a treatment method where disciplines work collaboratively to address complex issues as they relate to feeding difficulties. TR-eat® was developed by Elizabeth Clawson, Ph.D. and Carol Elliott, OTR/L in their search to find a treatment model for children with complex feeding problems that was consistently successful, easy to administer and met the needs of the child and family. • Disciplines work together and become crossed trained in oral motor skill treatment and behavioral interventions to provide transdisciplinary care. • The model is collaborative not consultative, all disciplines work together. • Treatment is closely integrated with medical intervention and nutrition as this is typically the underlying cause of feeding difficulties. • Positive reinforcement strategies are used to not only teach, but increase the rate of learning new skills. • Treatment is a child guided rather than child directed. Therapists observe subtle signs from the child to find the “just right challenge” to work within. There is structure; however treatment is advanced at a rate where the child is able to develop skills and confidence. • Sensory challenges are recognized. Sensory integration treatment is not the primary method of intervention but is incorporated into the model. Systematic desensitization (slow progression with sensory challenges) is used as part of treatment and found to be highly successful. • The model is easily implemented in a variety of treatment settings (i.e., center-based, home & school). • Treatment is systematic, structured and built on individual successes. • It is easy to learn and teach caregivers. • No specials tools or certifications are needed. The Pediatric Feeding Institute (PFI) provides workshops and training seminars in the area of pediatric feeding disorders. PFI follows the TR-eat® model (Transdisciplinary Effective Assessment and Treatment) for working with children presenting with feeding problems. The company was developed to educate healthcare professionals about the incidence and etiology of this problem. PFI also offers training in treatment interventions through workshops, seminars and on-site consultation. The workshop, Mealtime Miseries: Management of complex feeding issues, has been conducted throughout the US and Canada. Research in the area of pediatric feeding disorders has been published in peer-reviewed journals. Background/Medical History: NB is a 2.5 year old boy born full-term with a history of left congenital diaphragmatic hernia repair, pulmonary hypoplasia, gastroesophageal reflux disease and oral aversion. He was placed on ECMO for 7 days and a ventilator for an additional 27 days. Prior to 6 months of age he also had a nissen fundoplication surgery and gastrostomy tube placement including exploratory laparotomy and lysis of adhesions. He developed a problem with retching after receiving his nissen. He has had multiple revisions of the feeding tube due to leaking and granulation tissue and then conversion to a GJ tube secondary to feeding intolerance. His diaphragm reherniated prior to 12 months of age requiring a repeat primary repair with a patch. He has required resiting of his GJ tube and the prior site closed resulting requiring him to be NPO for several weeks. There have been multiple replacements of the GJ tube whic parents described as traumatic for him. At the time of admission he was being given Nutren Jr and Kids Boost Essentials 1.5 into the g-tube (daytime bolus and overnight) but progress with oral feeding had been minimal. NB was admitted to an intensive day treatment feeding program with 4 therapeutic feeding sessions per day involving transdiplinary care across occupational therapy, speech therapy and psychology. Initial Evaluation/Baselines: NB cried with any attempt of the therapists coming near him or even looking at him. NB was observed from a closed-circuit monitor while his parents attempted a meal. He cried with the transition to the treatment room. He sat in his mother’s lap for most of the first session due to refusal to sit in the booster seat. For the next two sessions he tolerated sitting for part of the meal in a Tripp Trapp chair but preferred to be in his mother’s lap. His parents provided verbal cues for him to take bites which he refused. They also tried handing bites to him and attempted to feed him, but all efforts were refused by either turning his head away, pushing away, keeping lips pursed closed, saying no and/or crying. He did not consume any food or drink during the baselines. He did take a few small sips of water independently from an open cup but volume was insignificant. Standard baselines with therapists feeding were not conducted due to NB’s extreme anxiety about the environment and separation from his parents. Medical: During week 1 NB was noted to be a very fussy child who generally acted like he did not feel well with random outbursts of screaming without any provocation. Admission medication included Zantac (2ml) 3 times per day. After consultation with the CDH team that had been providing is care, Zantac was reduced to twice per day and Prevacid was added once per day (15mg) via g-tube in the evening 20-30minutes before his overnight tube feeding. Because of loose stools, retching and report of previous reactions to dairy his formula was slowly converted from Boost Kids Essential 1.5 to Elecare during the first week. Retching during meals was an ongoing problem despite efforts at slow stretching. During the fourth week, following additional consultation the CDH team, Prevacid was increased to15mg twice per day and Zantac (3ml) was given twice per day. To rule out a hernia or problem with his diaphragm patch a MBS, esophagram, UGI, and small bowel follow through were completed with up to 8oz combined orally & via g-tube for the study. No retching occurred during the study. His diaphragm patch and nissen fundoplication were intact. Follow-up with a motility specialist was recommended after discharge from the intensive treatment program. Oral Motor: Due to significant defensives to touch to the face, NB required two weeks of gradual desensitization paired with positive reinforcement in order to tolerate the Beckman Oral Motor Assessment. Findings upon admission showed nonproductive patterns in almost all areas. Oral motor exercises were performed prior to each feeding session throughout the admission. Significant functional and measurable improvements were noted in the following areas upon discharge: Lower lip protrusion, elongation and strength, bilateral lateral tongue movement to the lower gum and cheek, tongue tip elevation, bilateral cheek ROM and strength, bilateral jaw strength and patterns for chewing. Week 1: The first week of treatment started with NB adjusting to transitioning to the treatment room, sitting in the Tripp Trapp Chair with the seatbelt fastened, playing with toys and remaining seated until the timer rang. His mother sat next to him and therapists gradually moved closer to him in the room during the first day. Oral motor exercises were initiated with his mother touching his upper and lower lip with approximations toward lip stretches. By the second day of therapy desensitization to the therapists wearing gloves was introduced. A dry cup, squeeze bottle and EZ spoon touched to his lips became part of the meal with even rotation. Touches to the lips gradually worked up to acceptance of the squeeze bottle straw and spoon into his mouth. A continuous reinforcement protocol with 1:1 schedule using video and toys was utilized after each bite/acceptance. The length of treatment sessions was increased from 10 to 15 minutes. By the third day of treatment water was placed in the cup, squeeze bottle and on the spoon prior to presentation. Sessions focused on acceptance of the spoon into his mouth. He initially demonstrated consistent swallowing of the water between 1-3g per trial from the squeeze bottle with small tubing. As NB demonstrated improved tolerance for therapy, meal sessions were increased from 15 to 25 minutes. By the end of the first treatment week he was consuming 19-22g of water per session. Week 2: NB showed remarkable improvement in desensitization to the treatment environment. He was able to transition to the therapy room without crying; tolerated oral motor exercises to the face and inside his mouth, and his mother did not need to sit right next to him in the room. Titration of Elecare into therapy sessions starting with 1cc dilution in 4oz of water and gradually increased ratio until achieved 100% by the end of the week. Elecare was presented on the EZ spoon and also in the squeeze bottle with small tubing straw. Handling was needed to help facilitate lip closure for clearing the spoon and swallowing due to his inefficient upper and lower lip strength and range of motion. Meal time was increased to 30 minutes in addition to time spent on oral motor exercises (total 45-60min) which continued for the remainder of the admission. Total volume of Elecare averaged 2oz from the squeeze bottle and 3-8g from the spoon. Week 3: Introduction of Stage II fruits and sweet potato on the EZ spoon was initiated. Elecare (100% concentration) continued to be presented in the squeeze bottle with small tubing straw. NB demonstrated understanding of continuous reinforcement protocol and was motivated by the anticipated positive reinforcement after each trial. The volume of Elecare consumed increased (ranging from 36g-84g per meal) as did volume of puree (ranged from 6g-21g per meal). NB continued to be volume sensitive with reflux symptoms, discomfort and retching noted when higher amounts were consumed. This also seems to occur after meals 2 and 4 even without increased volume at these meals. Retching overnight continued. Week 4: Spoon size was upgraded from and EZ spoon to the First Years Take-and-Toss Infant spoon. This allowed for a larger bolus to be given of the stage 2 foods. Crunchy dissolvable foods wrapped in organza mesh were introduced for exploration of chewing. By end of the week he tolerated Gerber puffs (no longer wrapped in mesh) using placement to molars. He was instructed to chew up to the count of ten. Vertical chewing patterns were noted bilaterally. 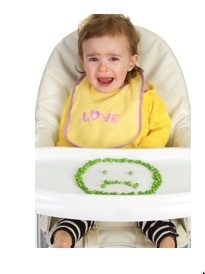 Rate of presentations of baby food and drink was slowed as needed to minimize retching. Volume for Elecare increased (ranging from 61g-78g per meal) as did volume of puree (ranging from 10g-27g per meal). NB continued to have volume sensitivity with reflux symptoms, discomfort and retching with higher volumes. No overnight retching was noted over the week. The CDH team was contacted and Prevacid was increased to 15mg twice per day along with Zantac 3ml twice per day. Weeks 5&6: A wider variety of stage 2 foods and mixed dinner combinations boosted with Elecare were introduced. Straw size for the squeeze bottle was upgraded to the large straw to allow for greater volume of Elecare per trial. Volume for Elecare consumed remained relatively unchanged however NB demonstrated occasional self-initiated sucking from the straw of the squeeze bottle. Volume of puree consumed continued to improve slightly. Week 7: NB was transitioned from baby foods to smooth pureed table foods which provided more calories and better nutrition. The spoon was once again upgraded to the larger Take and Toss toddler spoon. Soft solids and solid foods were introduced this week. They were placed on his molars to assist in facilitating a functional chewing pattern and decrease tongue mashing and suckling of food. Attempts were made to increased average volume consumed to greater than 3 ounces per meal. Total volume (combined drink and puree) ranged from 68-175g per meal. Week 8: NB continued to take soft solids and solid foods in addition to pureed foods. Attempts were made to consistently increase average volume consumed to greater than 4 ounces per meal. Total volume (combined drink and puree) ranged from 101-176g per meal. He was able to achieve 52-58% of his daily caloric needs by mouth. NB had reaction to milk including a rash around his mouth and hives after being fed small sips of milk shake at home over the weekend. Nutrition: NB was admitted receiving 60ml bolus feedings of Nutren Jr without fiber 5-6 times per day. He also received 800-850 ml total overnight of Nutren Jr plus 237ml of Kids Boost Essentials 1.5 at a rate of 65ml/hr. His recommended daily caloric needs were estimated at 1250-1350kcal per day. At admission his parents adjusted his tube feedings based on his degree of retching on any given day and weight gain had been poor. Prior to admission his oral intake was negligible. During the first week of admission he had not taken any calories orally. Over the course of the first week his formula was changed to Elecare in an effort to improve tolerance and decrease retching episodes. By week 4 he was able to consume 342 kcal/day by mouth across his 4 therapy sessions. By discharge, on week 8, average volume consumed increased to 620 kcal/day orally which met 52-58% of his daily caloric needs by mouth. NB was able to gain 5.13 grams per day over the course of the admission which met expected growth velocity of 5-6 g/day while going through the process of reducing tube feedings. Parent Training: By the second week of therapy, NB’s mother was trained in the structured meal protocol including the timer, supportive seating, administration of the reinforcement schedule as well as use of the squeeze bottle and EZ spoon. She was trained in all oral motor exercises by the 3rd week. Parent training was integrated into daily therapy sessions throughout the admission. NB’s mother replicated what she had learned daily by feeding him in the evenings and over the weekends. Continue outpatient feeding therapy 1-3 times per week with First Steps and 1-2 times per week with Psychologist from St. Mary’s Pediatric Feeding Program via telemedicine. If his First Steps therapist was not able to meet the need for increased frequency or did not see ongoing progress then1-2 times per week therapy with OT/SLP from St. Mary’s Pediatric Feeding Program via telemedicine could be added.